Hi, all! It’s done. This series was titled Unmentionables as an homage to the work Susannah Fox is doing in healthcare with trying to get people talking around the institutionalized “secrets” that are impeding progress in caring for people’s health. This series is about a very old personal story that had come back to haunt me and was interfering in my own healthcare. 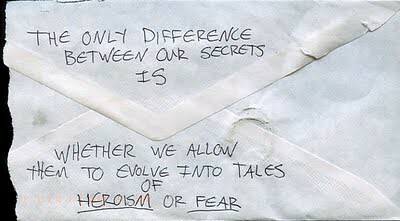 Susannah highlighted a particular quote from PostSecret: The only difference between our secrets is whether we allow them to evolve into tales of heroism or fear.